The tone is being set for the last half of the year, and it is turning out to be quite the dogfight. Apple and Samsung are on a crash course this fall, releasing their respective flagships. Both companies are taking stabs at each others bread and butter. Apple on one hand is expected to increase their screen size to compete with the industry standard of 4.5″+ while Samsung is rumored to be moving to the premium feel with a metal chassis. Apple has been near the top of the smartphone market for sometime now, but with the lack of ingenuity lately, they are dropping, and dropping fast. This year marks a big year for Apple because they are moving into uncharted territory. It all but confirmed from Apple that the iPhone 6 will launch with the biggest screen in the manufacturers history, with a iPhone 6 that comes with a 4.7″ display. Later in the year, we expect to see an iPhone phablet sporting a 5.5″ display. Will this be enough for Apple to regain their throne? Below you can see the expected specifications. Samsung has been the other king of the castle in the smartphone world, releasing devices with top of the line specifications, vibrant screens, and great cameras. This is going to be Samsung’s biggest fall on record. They are quickly trying to make up for lost sales with Galaxy S5, and they are thinking outside the box. Samsung is expected to release a phone made with a metal chassis and a Note 4 with a QHD display. It will also have a variation of the Note with a curved display. This will be an enormous for Samsung, not only going head to head with Apple’s flagship, but a flagship for the first time that matches Samsung’s screen size. 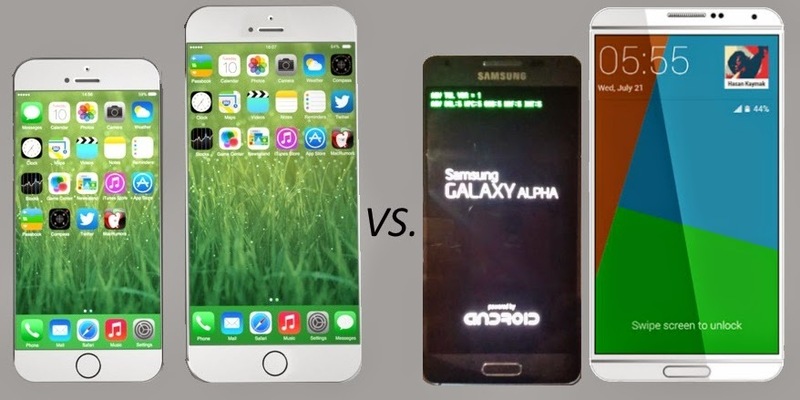 Can the Galaxy Note 4 and the Galaxy Alpha take on Apple and the iPhone 6? This September – November will be a great time for users, and for one of these companies. Users get their pick of the most popular handsets that are coming out the second half of the year, while these two companies will enter a dogfight. Only one company will come out on top of the charts. We can only wait to see what happens. Who do you think it will be? Qualcomm’s new lineup leaked: Specifications are mouth watering!